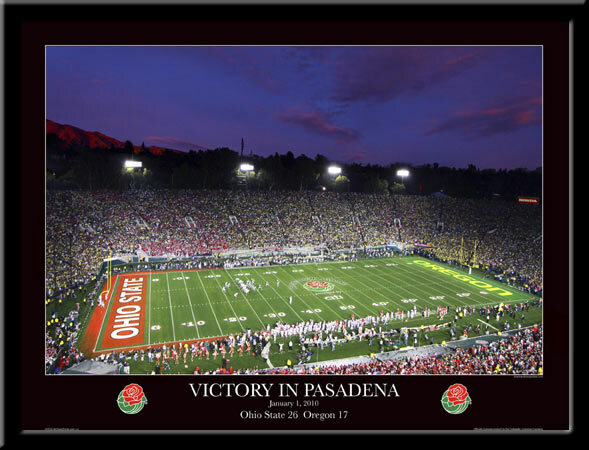 Ohio State Rose Bowl Posters! On January 1, 2010, The Ohio State Buckeyes beat the Oregon Ducks at “The Granddaddy of Them All”, the Rose Bowl. MyTeamPrints.com was ready for the game with photographer Brian Hendricks on board to make the trip to California in hopes to capture a photograph worthy of producing a poster. MyTeamPrints.com contacted the Digital Dept. a week or so prior to the game to make sure they got into the schedule for all of the design work that goes into a poster of this caliber. The Digital Dept. was ready for the task at hand. When Hendricks returned from the game, he had over 1500 photos to choose from! Sally and Larry over at MyTeamPrints.com worked with Hendricks to narrow the field down to a few dozen photographs and then ultimately down to two. But which one to choose? MyTeamPrints.com had us start working on the initial drafts of what was thought to be their final choice but it was clear early on that they would have to produce two posters. Yes two! A few days later, and many hours of editing, revisions and proofs and we have two of the finest Ohio State Rose Bowl posters around! 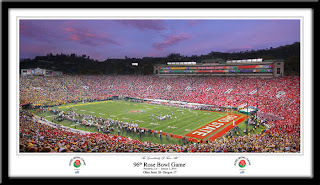 Click MyTeamPrints.com to see both of these new Rose Bowl posters. MyTeamPrints.com is family owned and began as a custom framing business some 25 years ago. Being in Buckeye Country, they created the website in 2003, after Ohio State won the 2002 National Football Championship as demand for OSU prints grew. Shipping nationwide allowed displaced Buckeye fans around the country an outlet to purchase prints they couldn’t find in their hometowns. Inquiries started coming in from fans of other colleges looking for similar prints of their schools. They soon added other colleges, pro sports, golf and NASCAR. Could you tell they LOVE sports! MyTeamPrints.com is licensed with The Ohio State University and have published to date 10 exclusive Ohio State posters. Questions or comments? You may leave a comment below or email our sale department anytime at Sales@DigitalDept.com.